On a warm afternoon in October this year, we were walking past a few of the other campers at our campsite at Cowra when the kids couldn’t resist being attracted to a cute dog in one of the vans, on closer inspection we saw it was, in fact, three small dogs and a cockatoo. This led us to meet Ron and Annette, fellow full-time travellers who love travelling with their pets and go to great length to make sure they are well looked after while on the road. We got chatting to them both and thought we would share their story with other travellers, especially those who are thinking of living full time on the road and want to bring their pets along. Then another common question was asked, one that many considering a life of full-time travel on the road probably all ask. Should we sell the house or not? So with that decided they sold the house and purchased an Adria caravan and Mitsubishi Pajero to tow it. Both Ron and Annette worked before they left home. Ron was previously a mobile phone repairer and thought it was the ideal job to take with him on the road. It is more of a hobby now, but also a good way to meet other campers and share stories, and gives them a bit of extra spending money while on the road. Ron is able to repair most makes and models but tends to specialise in iPhone repairs as the parts are readily available, whereas with Android there are so many different makes and models. He can still repair them, but sometimes just has to wait for spare parts to arrive. Look for the sign on the back of Ron’s car. Ron is also a budding drone pilot, having recently purchased a Mavic DJI and is having a tonne of fun filming his adventures around Australia. It didn’t take much convincing for Ron to get the drone up in the air and he was able to give us some amazing aerial photos and footage of our campsite. Annette’s love is clearly her pets. Prior to leaving Maryborough, together with Ron, they had started up a rescue group for small dogs and helped to find them homes. However, when they were ready to leave for the trip, she couldn’t bear to part with the last four so decided to take them all with her. Sunny, Madelynne and Tessa now take command of the back seat when they travel, but sadly, Tara, who was 15 years old passed away from illness a few months ago. Prior to undertaking the trip Ron and Annette researched all the ways to travel with pets and found the best solutions for them. Then there is Billy the White Sulfer Crested Cockatoo who after owning for 37 years, Annette discovered was a girl Billy, not a boy Billy. We were wondering why he/she was acting a little strange and soon found out when there was an egg at the bottom of the cage. Billy is no problems to take around and is often the centre of attention with other travellers, but not so much Ron, who she tried to bite as we watched him try to move the cage. We have two cages for her, one she travels in the car with, then a larger folding cage we put her into when we settle in. ‘Billy’ the boy who lays eggs! They do a bit of research before going to the next site to see if they can take pets, and often try to stay more than one night in any location so they don’t have to set up and pull down the annexe too often. It also gives them more time to explore the area and a chance to meet other travellers. I asked what it was like finding a vet whilst travelling, but Annette assures me it has been no issue. They stopped and found vets in Port Macquarie then Sydney and it was not an issue at all. Each year Annette has to find a bird specialist also, as Billy needs oestrogen implants so I need a bird specialist. We asked Annette if she had any advice or tips for other pet owners who wish to travel. Be considerate of other campers, do some training with your dogs to prevent them barking. Be prepared and invest in some panelling or portable fencing to give the dogs an opportunity to still run around. Be prepared to restrict some of the areas you go to, but in many towns and locations, there are pet minding services you can utilise for a day or two. I finished off our chat with our usual questions. Q. What has been your favourite place so far? Q. What advice would you give to anyone thinking of doing the big lap? 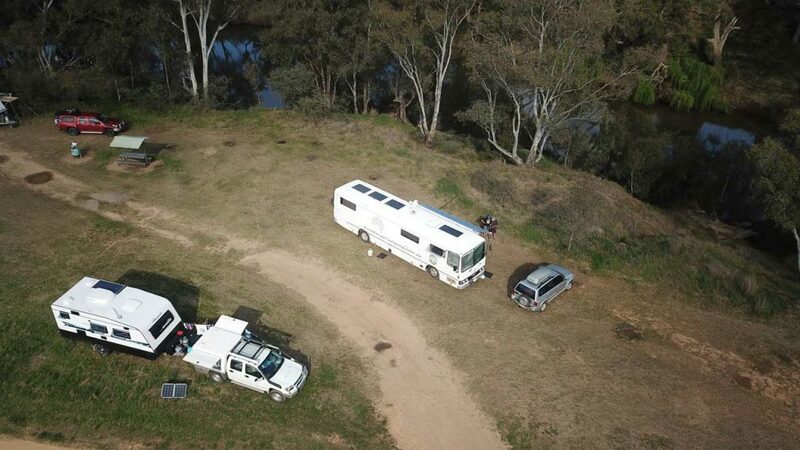 We hope you found Ron & Annette’s story beneficial, and if you are thinking of travelling with Pets, be sure to use the Pets Permitted filter in the Free Range Camping directory to help you find Pet-Friendly locations to stay at.